Fess Elisha Parker, Jr. (born F.E. Parker; August 16, 1924 – March 18, 2010), was an American film and television actor best known for his portrayals of Davy Crockett in the Walt Disney 1954–1955 TV miniseries, which aired on ABC, and as Daniel Boone in an NBC television series from 1964 to 1970. He was also known as a winemaker and resort owner-operator. Parker was born in Fort Worth, Texas, and raised on a farm in Tom Green County near San Angelo. His father, a tax assessor, had the same first name which had been given to him in honor of the educator and politician Simeon D. Fess. The middle name "Elisha" was chosen by the future actor himself, when he was a teenager (about 1937) because it sounded rhythmic and matched his middle initial. He enlisted in the U.S. Navy in the latter part of World War II, hoping to become a pilot. He was turned down because he was too tall at 6 feet 6 inches (1.98 m). He then tried to become a radioman gunner, but he was found too big to fit comfortably into the rear cockpit. He was finally transferred to the United States Marine Corps as a radio operator and shipped out for the South Pacific shortly before the atom bomb ended the war. Discharged in 1946, he enrolled at Hardin–Simmons University in Abilene, Texas, with assistance from the GI Bill of Rights. After an automobile collision, he was stabbed in the neck by the other driver during an argument. He was an active member of the H-SU Players Club and transferred to the University of Texas at Austin in 1947 as a history major and continued to be active in drama. Parker graduated from UT in 1950 with a degree in history. He had been initiated into the Pi Kappa Alpha fraternity. Having one year remaining on his GI Bill, he studied drama at the University of Southern California, where he pursued a master's degree in theater history. Parker began his show-business career in summer 1951 when he had a $32-a-week job as an extra in the play Mister Roberts, although he is credited with the voice of Leslie, the chauffeur, in the 1950 film Harvey. Within months, he was on location with a minor part in Untamed Frontier with Joseph Cotten and Shelley Winters. Parker became a contract player with Warner Bros., appearing in small roles in several films such as Springfield Rifle (1952), Island in the Sky, The Bounty Hunter and Battle Cry. In 1954, he appeared as Grat Dalton in the Jim Davis syndicated Western anthology series Stories of the Century in the episode "The Dalton Brothers". In another 1954 appearance, Parker was cast as Curt Morrison, a cowboy/militia-marshal patrolling the land rush in the New Mexico Territory, in the episode, "The Kickapoo Run" on the syndicated anthology series, Death Valley Days. Nancy Hale played his romantic interest, Bonnie Carter, whom Morrison meets again years later after the death of her husband. In the 1961 Death Valley Days episode, "A Miracle at Whiskey Gulch", Parker portrayed the Reverend Joel H. Todd, who tries to instill Christian principles in a wild frontier town. 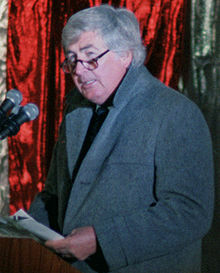 Others in the episode were Eddie Firestone as Applejack Jim and George Kennedy, cast as Steamboat Sully, who engage in a brutal fistfight. According to Parker himself, when the Walt Disney Company was seeking an actor to play Davy Crockett, James Arness, later cast as Marshal Matt Dillon on CBS's Gunsmoke, was first considered for the title role. Parker had recently graduated to being a contract weekly actor but listened to his agent and appeared in a Warner Bros. science fiction film about giant ants called Them!, which required only one day's work. He had a small scene as a pilot put into an insane asylum after claiming his plane had been downed by giant flying insects. Arness appeared in a larger role in the same film. During the screening of this film, Walt Disney looked past Arness and discovered Parker. Disney was impressed by Parker's portrayal of a man who was unswerving in his belief in what he saw despite the forces of authority against him. Parker was asked to drop by the Disney Studio. When he did, he brought his guitar, met Disney, sang a song, and then said goodbye. Several weeks later, Parker was informed that he had been selected over Arness and several others for the role, including Buddy Ebsen, who eventually played Crockett's sidekick, Georgie Russell. Disney's three-episode version of Crockett depicted his exploits as a frontiersman, congressman, and tragic hero of the Alamo. The episodes have been called the first television miniseries, though the term had not yet been coined. Davy Crockett (1954–55) was a tremendous hit and led to a merchandising frenzy for coonskin caps and all things Crockett. Parker became a contract star for Disney and appeared in The Great Locomotive Chase, Westward Ho, the Wagons!, Old Yeller, and The Light in the Forest. He complained that they were all basically the same role. Disney refused to lend Parker for roles outside that persona, such as Jeffrey Hunter's role opposite John Wayne in The Searchers and Marilyn Monroe's leading man in Bus Stop. Parker was dissatisfied with Disney's proposal to only use him in a small role in Tonka. He was put on suspension for refusing the role, and subsequently left Disney. Parker made guest appearances on many television programs, and composed and sang. He performed the occasional role of Tom Conrad, editor of the Diablo Courier in the syndicated western series, Annie Oakley (1954–1957), starring Gail Davis, Brad Johnson, and Jimmy Hawkins. Parker was contracted to Paramount Pictures from 1958 to 1962. He appeared in a small assortment of Paramount movies, including a cameo as an unnamed frontiersman in Bob Hope's Western comedy Alias Jesse James and supporting roles in The Hangman (1959) with Robert Taylor, The Jayhawkers! (1959) with Jeff Chandler, and Hell Is for Heroes (1962) with Steve McQueen. In 1962, he starred in the title role of the TV series Mr Smith Goes to Washington, portraying the same idealistic character that James Stewart had played in the 1939 film. Parker took to the stage in 1963, in a traveling production of Oklahoma! as Curly. The movie roles he sought were elusive. In 1966, Parker starred in the movie Smoky, directed by George Sherman where he played the role of Clint Barkley, who finds a black stallion named Smoky a wild stallion who eventually becomes a wonderful cutting horse and the best friend an old cowboy could ever want. Parker's Daniel Boone television series portraying another historic figure of America's frontier days began filming in 1964. Over its six years (1964 to 1970) as one of the highest-rated shows of its time, Parker was not only the star of the series, but also the co-producer and director of five of its most popular episodes. Parker became interested in opening a Davy Crockett-themed amusement park. In the late 1960s, he optioned land in northern Kentucky at the confluence of Interstates 71 and 75, with the intention of building Frontier World. However, when the Taft Broadcasting Company of Cincinnati, Ohio, began building Kings Island Amusement Park in nearby Mason, Ohio, less than a 2-hour drive from Parker's site, financing for Parker's venture dried up. Turning down the title role of McCloud, Parker retired from acting at the age of 49 after a sitcom pilot called The Fess Parker Show was broadcast on March 28, 1974, but was not subsequently picked up by the network. Fess Parker was nominated for best new personality Emmy in 1954, but lost to George Gobel. He was never nominated again, nor was his show Daniel Boone. In 1991, he was named a Disney Legend. In 2003, Parker received the Texas Cultural Trust's "Texas Medal of Arts Award", established only the year before. For his work with Disney, Parker was honored in December 2004 with his own tribute window on a façade in the Frontierland section of Disneyland. After his acting career, Parker devoted much of his time to operating his Fess Parker Family Winery and Vineyards in Los Olivos, California. 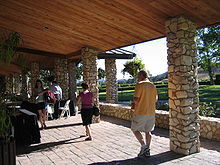 The winery is owned and operated by Parker's family, and has produced several different types of award-winning wines. Parker's son, Eli, is President and Director of Winemaking and Vineyard Operations, while daughter, Ashley, is Vice President of Marketing and Sales. The Parker operation includes over 1,500 acres (610 ha) of vineyards, and a tasting room and visitor center along the Foxen Canyon Wine Trail. In addition to wine, the winery is known for selling coonskin caps and bottle toppers inspired by Parker's Crockett and Boone characters, and for its appearance under another name in the movie Sideways. In reminiscence of his acting days, Parker's wine labels have a logo of a golden coonskin cap. In 1985, Parker briefly flirted with running in 1986 for the United States Senate as a Republican for the seat of incumbent Democrat Alan Cranston. He considered himself a conservative in the mold of Ronald Reagan. Parker married Marcella Belle Rinehart on January 18, 1960. They had two children, Fess Elisha Parker, III, and Ashley Allen Rinehart, along with 11 grandchildren and a great-grandson. Parker died of natural causes on March 18, 2010, at his home in Santa Ynez, California, near the Fess Parker Winery. "Annie Oakley: (May 8th, 1954), Annie and the Texas Sandman"
^ a b c Weaver, Tom. Sci-Fi Swarm and Horror Horde: Interviews with 62 Filmmakers, p. 148 (McFarland 2012). ^ Obituary London Guardian, March 19, 2010. ^ Obituary London Independent, March 25, 2010. ^ "Davy Crockett actor Fess Parker dies, aged 85". BBC. 19 March 2010. ^ Duke, Alan (March 18, 2010). "'Daniel Boone' star Fess Parker dies". CNN. ^ a b c Seale, Avrel (July–August 2003). "Playing the Hero". The Alcalde. University of Texas. 91 (6): 34–37. Retrieved 19 March 2010. ^ a b McLellan, Dennis (March 18, 2010). "Fess Parker, who played Davy Crockett and Daniel Boone on TV, dies at 85". The Los Angeles Times. Retrieved March 18, 2010. ^ "Annie Oakley". tvacres.com. Archived from the original on February 4, 2013. Retrieved January 11, 2010. ^ Associated Press (7 February 2003). "Talented Texans to be Honored". The Houston Chronicle. p. 2. Retrieved 2008-01-22. Wikimedia Commons has media related to Fess Parker.